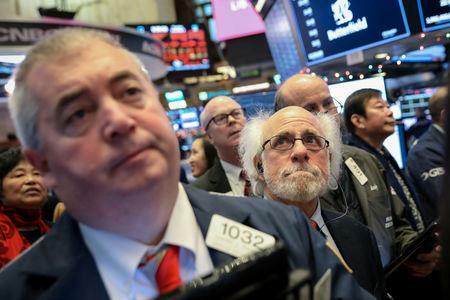 "The market had gotten way oversold," said Gary Bradshaw, senior vice president and portfolio manager at Hodges Capital Management in Dallas. "Investors looked up and saw they could buy good companies at much cheaper valuations than they could a couple of months ago." The arrest came as investor enthusiasm had already faded following a truce reached over the weekend in talks between the United States and China, which had prompted some hope about resolving differences over trade that have clouded the stock market's outlook this year. The Dow Jones Industrial Average <.DJI> fell 79.4 points, or 0.32 percent, to 24,947.67, the S&P 500 <.SPX> lost 4.11 points, or 0.15 percent, to 2,695.95 and the Nasdaq Composite <.IXIC> added 29.83 points, or 0.42 percent, to 7,188.26. Financial shares <.SPSY>, which are sensitive to bond yield swings, fell 1.4 percent. The energy sector <.SPNY> slumped 1.8 percent and was the worst performing group, as oil fell after OPEC and allied exporting countries ended a meeting without announcing a decision to cut crude output. Losses for the S&P 500 were mitigated by gains for Amazon <AMZN.O>, Netflix <NFLX.O> and some of the other technology and internet stocks that have been hit particularly hard during the market's pullback in recent months.